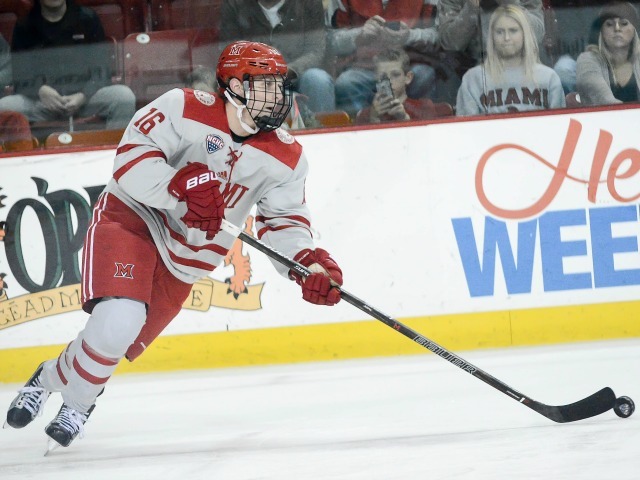 OXFORD, Ohio – Miami was able to erase a two-goal deficit early in the third period on Friday. Unfortunately for the RedHawks, the next three markers would belong to No. 2 Denver. The Pioneers beat MU, 5-2 at Cady Arena, sending Miami to its third straight loss and a 1-6-1 record in its last eight games. The RedHawks (9-14-6) are also guaranteed a non-winning regular season for the third time in four years. Despite Miami being outshot, 13-6 in the first period, the teams headed into the first intermission scoreless. But Denver (21-6-4) finally broke through on the power play, as Evan Janssen twice tried to stuff the puck in the near side of the net, but after two denials by RedHawks goalie Ryan Larkin, the puck shot out to Dylan Gambrell, who hammered it home 4:20 into the second period. Just 72 seconds later on another man advantage, the Pioneers’ Will Butcher wristered one in from the blue line that was deflected away by Larkin, but Troy Terry batted it in out of the air. The play was reviewed for several and after initially being ruled the puck was played by a high stick, that call was overturned and the Pioneers went up, 2-0. At the 4:15 mark of the third period, Miami’s Zach LaValle cut the lead in half when he stuffed the puck in the short side, as it somehow got through goalie Tanner Jaillet off a centering feed by Gordie Green from behind the net. Miami defenseman Jared Brandt (photo by Cathy Lachmann/BoB). The RedHawks pulled even with 10:39 remaining when Jaillet gave up a huge rebound off an outside shot by Grant Hutton, who had stole the puck to keep it in the offensive zone seconds earlier, and Jared Brandt blasted it home. LaValle’s goal was his first of the season, while Brandt’s was his first as a Miamian. But that lead was short lived. With 6:04 left in regulation, Gambrell won an offensive zone to Butcher, who skated into the slot uncontested and fired one just under the crossbar to give Denver a 3-2 lead. The Pioneers regained their two-goal lead when Janssen pitchforked a backhander toward the net, and it hit Gambrell at the top of the crease and popped over the shoulder of Larkin with 3:38 left. It was 32 seconds later when Denver sealed it on an empty netter from Emil Romig. In addition to clinching a non-winning regular season, Miami can finish no better than .500 in NCHC play, as it slipped to 5-10-4 in the conference. The RedHawks remain in seventh place, five points behind Nebraska-Omaha and North Dakota. These teams wrap up their weekend series at 8:05 p.m. on Saturday in a game that will be broadcast on ASN and carried by Altitude Network. Posted on February 18, 2017, in 2016-17 and tagged 2016-17 miami redhawks, Denver Pioneers, gamer, jared brandt, NCHC, zach lavalle. Bookmark the permalink. Leave a comment.